A comprehensive listing of resources for writers, including online writers workshops and hundreds of links in categories such as Genre Fiction, Markets for writers, newsletters and lists, publishers and agents. writers workshop open to all writers of all ages. areas covering interactive story telling, poetry, short stories, non fiction, writers tips, message boards and chat room. A news and review magazine, web how-to and bookstall for writers. A forum, writers showcase and discussion group. Focuses on additional ways for writers to earn money, ideas are not specific only to writers, however. A series of useful tools to enhance writers and students creativity, spark ideas and fight writers block. Links to resources/information for writers and publishers, free-to-use articles by Margot B, writers and publishers forum, guest writers. A volunteer run writers resource, based in Melbourne, Australia. Exposing new writers to the world, and providing resources for fledgling writers. Terescia Harveys resources for romance writers, including articles, links to software for writers, and reviews of books for writers. Writing lessons for creative fiction, a glossary of terms for writers, a listing of markets accepting freelances, and forum of writers. An online organization of professional freelance writers of non-fiction. The website also features reference and research links of interest to writers of any genre. A co-operative group of Australian-based travel writers comprised of some of the countrys most experienced and awarded writers and photographers. Writers Digest features daily writing and publishing updates, writers guidelines, ranking of places to get published, courses and contests. Writer Anne E. Skalitza gives tips and links for aspiring writers. She is also an enthusiastic speaker on the subjects of creative writing, getting published, and the writers life. Consulting for writers in all media, corporate and brand consulting, writers seminars, books and tapes. Author of 'The Writers Journey,' expert on myth-based storytelling. An online writers trade magazine dedicated to putting writers on the map. Aside from bi-monthly issues that are filled with tips from industry insiders, it also offers services to help writers succeed. How-to writing tips, inspiration and resources for beginning and experienced health writers. Market newsletter, book catalog, articles, updates, and writers links. A forum for writers of all kinds, intended for support, help with research, critiquing and everything else a writer might need while working. Primarily intended for paranormal romance writers, we have plenty of other sections for nearly every genre you can think of. brief glossary of primary writers and precursors of the surrealist movement, with many links to sites on individual writers. If the business hours of Dalkey Writing Group in may vary on holidays like Valentine’s Day, Washington’s Birthday, St. Patrick’s Day, Easter, Easter eve and Mother’s day. We display standard opening hours and price ranges in our profile site. We recommend to check out dalkey-writing-group.netfirms.com/ for further information. 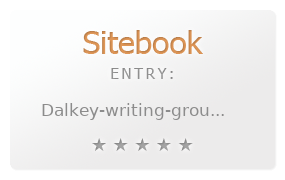 You can also search for Alternatives for dalkey-writing-group.netfirms.com/ on our Review Site Sitebook.org All trademarks are the property of their respective owners. If we should delete this entry, please send us a short E-Mail.